Back over two years ago Karen and I hid a Geocache in North Kohala, we called it the Windy Bluff Cache. It’s like a hidden treasure with your treasure map being the Geocaching website and your GPS unit. That was two long years ago since I visited the cache. Today I had an assignment right next to the cache site so I decided to visit and see what I’d find or if it was even there. To my surprise not only was it there but the logbook, which obviously has been damp off and on at times, had a number entries in it. More entries than people reporting on the Geocache website. Obviously even people who have stumbled upon it over the past two years have written in the log and thoughtfully put it back into its hiding place. For that I’m grateful, even an entry by someone saying they were ‘tweaking’ put the cache back. 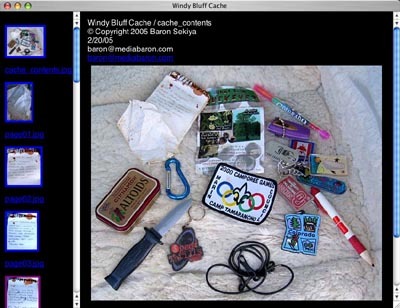 Click on the gallery above to see the contents of the Windy Bluff cache and pages from the logbook. I added a couple of things to the cache and put it back. Dummy me I forgot to put an entry into the logbook myself but I’ll probably go back and put a new log into there, the current one has rust on its spiral bind and pages are slightly damp.